With the DASH!860/ShadeMASTER combo came the software package “ThruView” (this is the sales brochure). They were flaky sometimes, didn’t reliably work with the printer looped through them and there was a 50% chance they refrain from working when upgrading your PC. Ok. Thanks for that ma’am. Here we are. 25 years later and the last dongle for it probably went the way of the Dodo. Out went the Disassemblers. I recommend IDA Pro for comfortable work on your recent Windoze workstation and SoftICE to work on the bare metal itself. As far as I can see, XNIX is loaded correctly. For now I have the suspicion that there are communication issues with the DASH!860 due to my PC workhorse is a ‘modern’ Pentium 1 MMX… and we all know how lazy programmers were back in the days when it came to delay-loops etc.. So next up: Tow the trusty 80486 system out of the basement and check it with that one. Ok, on my 486-PC I was able to successfully load the XNIX kernel in real-mode (‘x.exe /r’) and using the debug-flag I saw some errors about config-files not found in C:\TVPLUS… wtf? All paths are set in the .cfg file but it seems some are just ignored and hard-coded. Ok, so I created that folder and copied everything over and called ‘rstub ___tv1’ again… and this time it worked! Ohhhh-kayyyy. So my assumption that ‘.pic’ meant a PICtor file was wrong. Some intense Google’ing later I’ve learned that the file format is the “Biorad PIC“. I could have guessed that before. 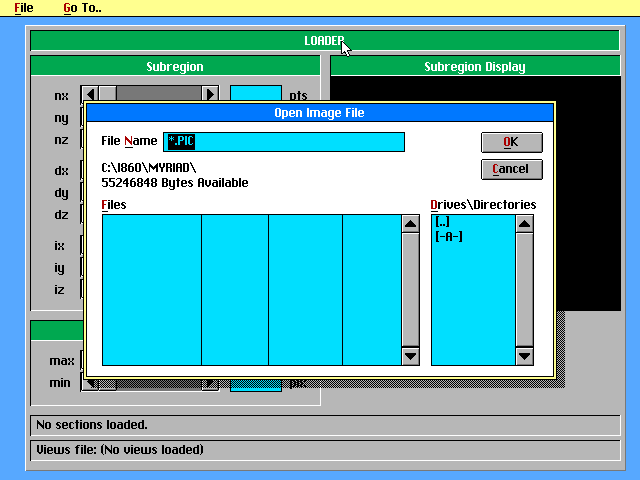 Those times were the times of proprietary formats. How to get such a file to play around with it? Luckily others had the same problem. ImageJ seems to be the main tool for converting scientific visuial data, and it has a native support for reading Biorad PICs. But how to create one? Well, thanks to this tool, you can create it when creating .raw files before using ImageJ. A bit cumbersome – but hey at least something. While my file loads fine, I wasn’t able to get a picture on the ShadeMASTER VGA output yet. I can hear the relay switching the outputs and my LCD display catches the signal correctly (dimensions as well as refreshes) but it’s just black. This is a ‘special moment’ for me, as this is the first time that the available RAM of one of my i860 cards was actually filled with meaningful data.